Please refer to our stock # TI10031 when inquiring. 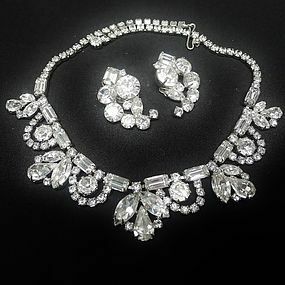 This is a lovely old choker necklace with a design composed of a number of shapes and sizes of clear rhinestones. It is 15" long and the front designs are 1" wide. The back is a shiny silver color, rhodium plated as most were when this was made back in the middle of the 20th Century. The earrings are clips and each one is 1 1/4" long by 3/4" wide. This is not a true set, but I found the pieces together in one box and they do complement each other when worn, so I left it the way I found it. None of the pieces show wear or problems, and none is marked.